I was very curious about how still these geese were. Watching them in the pond at Warner Park they appeared to be motionless. Because of that, I decided to try an experiment to see if I could get a successful HDR of them as they floated in the pond. You don’t see many High Dynamic Range (HDR) photos of animals, particularly ones floating in a pond, for the simple reason that they are usually moving. In order to get a successful HDR image you need at least two and usually three or more photos in which everything in each of the photos is nearly motionless vis-à-vis the other photo(s). If not, you will have “ghosts” when the images are combines to make the final image. Tiny movements by the geese in the three photos used here would be okay, but an inch of movement by any of the Geese would be a problem because each exposure was only 1/40th of a second long (it would normally be better to vary the shutter speed and keep the aperture the same, but I didn’t want to push my luck on how still the geese could be). 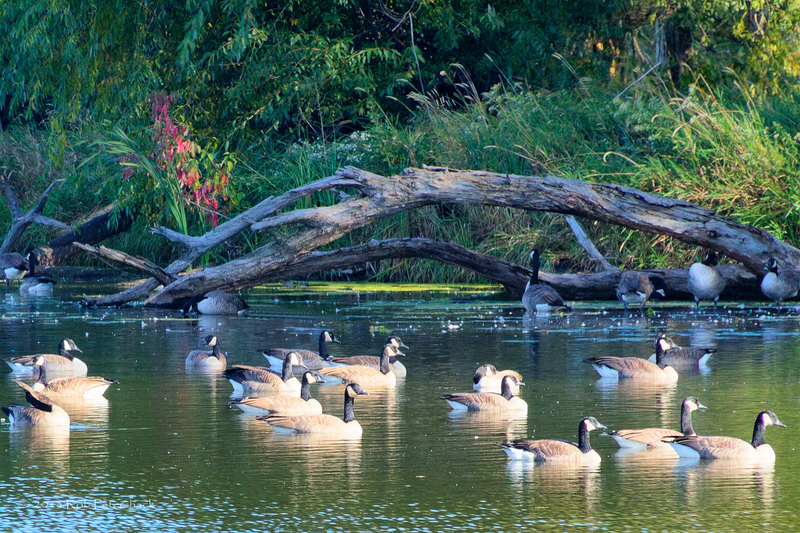 Since the photo worked, you can see that the geese are remarkably still. Readers of this blog know that I like to experiment with my photos. I don’t do it all of the time, but I like to try things just to see if they work out. That is the truly great thing about digital photography is that it gives one the freedom to try new things without incurring great expense. This is a photo that I have been experimenting on for at least a year. I was in the San Jose, California area for a nephew’s wedding and we took a drive to the coast because we had some time to kill. We hit 17 Mile Drive (tons of photos, I’ll post some other one’s in the future) when got out of the car for some scenic view or another (don’t get me wrong, the scenery is spectacular). It might have been the Lone Cypress (which, FYI, is not, but is still a nice photo as long as you have some time to spend with Photoshop). As I was meandering (my usual state of affairs) my way back to the car, I saw the dead tree pictured in this photo. I had a small “Octopus Style” tripod with me, but It was too light for my camera to get any useable shots for HDR. It was also too short. There were plenty of people around – every one of them ignoring what I thought was potentially the niftiest tree photograph that I was going to take for quite some time. Unfortunately, while no one cared about the tree, no one at all cared about getting in my way as I tried to take pictures of it either. My wife also, quite correctly encouraged me to move on (though faster than I wanted to) because there was my nephew’s wedding. By the way, what you don’t see here is that about half of every element of the picture was in the bright sun, while the other half was in fairly deep shade (thus the thoughts of HDR at the time). One of the many great thing about photography (especially if — this is for any newbies — you are shooting in RAW and preserving the original files through non-destructive editing) is that you can pick up an old project and try, try again (this time using Silver EFex Pro 2). Another thing, there is also plenty of color in the photo so that is fun to play with as well. Finally, for those of you who have made it this far any comments or suggests or ideas are greatly appreciated.